Last weekend I took part in 'Made in 72 Hours', an LGBTQIA+ inclusive, body positive showcase of adult beginner and improver ballet, tap, cabaret, commercial and contemporary dance. As well as performing (on stage for the first time in 17 years, on pointe for the first time ever!) I also helped to source, fit and alter costumes. Since this had been my full time job for several years, it wasn't as daunting a task as learning and remembering a dance routine in 72 hours, but working with a tiny budget and a diverse range of bodies has taught me some interesting things about clothing, and the limitations of fast fashion. 'Made in 72 Hours' was the fourth showcase I'd worked on with dance teacher Amanda Leon Joyce who picks the overall costume theme for each routine. To save money, these themes are often a colour or style of clothing, so costumes can be borrowed, swapped, bought from charity shops or liberated from the back of the wardrobe if they are not considered 'appropriate' for everyday wear. I don't usually see these costumes until the dress rehearsal, and it's always a joy to see a group of people cheerfully disobeying fashion 'rules', disregarding all the passive aggressive advice designed to shame us into looking the same as everyone else. If you give people a safe space and the costume brief "anything that makes you feel amazing" you'll end up with a celebration of individuality and body positivity that would be impossible to design. For other routines, a cheap item of high street clothing is often the base for a costume. In previous years, we fell into the trap of assuming a loose-fitting viscose dress would allow for the range of movement needed for a Grade 2 routine. Buying and fitting a dress in a range of sizes from 8 to 20 was eye-opening: it didn't fit anyone! Even a simple port de bras was impossible as the cut of the armhole and sleeve was too restrictive. Unpicking ten pairs of sleeves gave me plenty of time to think about why the fit of high street clothing is so unacceptable, and why so much of it gets discarded. In order to save time and money during the making process, all the design features that would allow for a comfortable fit and ease of movement (well placed darts, for example, or a set-in sleeve with extra ease in the sleeve head) have been eliminated, leaving loose fitting clothing that looks good on a hanger or when you first put it on (standing still in front of a mirror, hands by your sides) but soon feels uncomfortable or restrictive once you start moving around. The arbitrary nature of sizing for womens clothing also means even the fit of stretch items can vary wildly; Bardot-style stretch lace tops bought to be worn over romantic tutus for a pointe piece fitted (or didn't) dependent on the dimensions of the body, not the dress size of the dancer. I had assumed that costume items would go to the charity shop or back into the depths of everyone's wardrobes after the shows,so I was surprised and delighted when I saw the (now sleeveless and better-fitting) dresses I had altered being worn to subsequent dance classes. The dancers were thrilled to have a garment that fitted well, that they knew would be comfortable to dance in. Occasionally for the showcases I have made a costume piece from scratch, and I am really touched by how appreciated these are; within minutes of handing out some simple handkerchief hem jersey skirts several people were wearing them as rehearsal gear, while one of the dancers took to wearing it as a shawl to keep warm between routines. 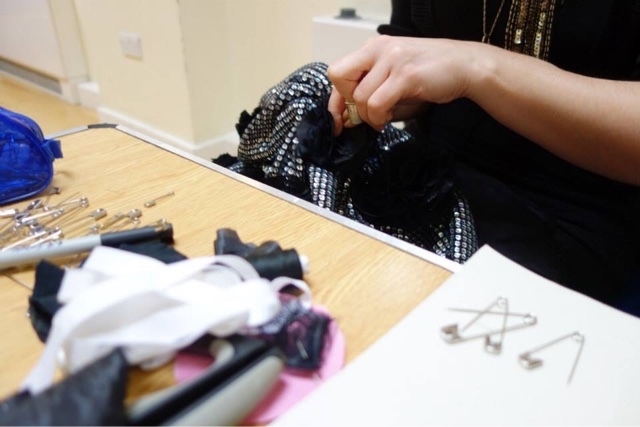 On most shows I have worked on, costumes have been carefully looked after by the wardrobe department until the performers are ready to put them on, but I found that when people have put time and effort, not to mention their own money, into thoughtfully sourcing their own costumes, they take good care of them. Over the course of the 72 hours, we travelled between our own homes and four different venues, and every item of costume made it on to the stage unscathed! Working with this amazing group of people has taught me a lot, not least about our relationship with our clothes. When we feel an emotional connection with what we wear - when they have been made for us with love or remind us of a time when we could be our best selves - we treasure them even if they are not exquisite designer pieces. For an industry that claims to be all about creativity, fashion constantly seeks to impose rules on us and to pass judgement on our bodies, and it's so refreshing to be part of something that collectively rejects those restrictions. For one rehearsal, Amanda wore a t-shirt bearing the slogan 'your body isn't wrong, society is'; I can't think of a better way to sum up what I learned from my 72 hour showcase experience.